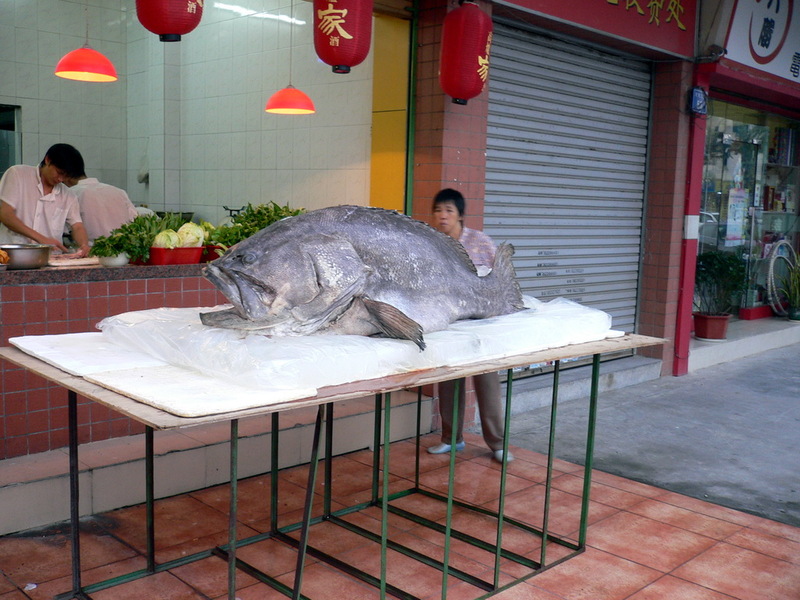 Got an sms from the Towkay-neo of a nearby Teochew restaurant telling us to come down as they have a 200 斤 Grouper for the weekend. Initially, I misheard it as 公斤(kilogram) and was thinking holy mackerel! (grouper in this case), that is more than 3 of me! Anyway, as it turned out, the sms said 200 斤 which worked out to be 100kgs. Still a heck of a big fish by my count. We got to the restaurant the following evening with the fish proudly on display. The official weigh-in stood at 134kgs (268 斤). How to eat this fish? Well, we didn't have a choice on account of the fact that this was a Teochew steamboat restaurant that specialises in Grouper. So what other way then to eat it steamboat style? Before, anyone gasped how we were able to eat up the fish, we can't. The fish was meant for the restaurant's weekend business. We were told that the fish was originally planned for Friday, Saturday and Sunday but given that business was so good. The fish won't make it past Saturday's dinner crowd. The fish was fresh and very juicy. The skin itself is about 1/2 inch thick and chewy. Alas the highlight of the night was the last course where everything inside the steamboat was scooped up and in their place, white rice, ginger, and lotsa pepper to make porridge. Something about Grouper or in Ch1nese 石斑鱼 here. Some people spell it as Garoupa or Groper but essentially, they all point to the same fish sans the sub-species variations. One may ask that a grouper of this size would have been rare and wouldn't it risk extinction, given our idiotic tendency to over fish? Fortunately, big groupers are common and this particular sub-species of the grouper family is not on the endangered list. Furthermore, now that their natural enemy's, the shark, population is fast being decimated as a result of an over active sharks' fin trade, this grouper sub-species population is set to boom. Unfortunately, this can't be said for their cousin, the Goliath Grouper, which is currently classified as Critically Endangered. These GCs can go all the way up to 700+kgs and the good news is that the population numbers are starting to look good, albeit slow. Let's keep our fingers' crossed. aloe: The skin supposed got some dunno what they call it which is supposedly good for the joints. Also the fats in there is high in Omega-3. aloe: Ok, I found out the "dunno what they call it". I was refering to Collagen which is supposedly very good for a person's joint mobility. And 700+ Goliath Grouper?! That's like a monster. Or a small whale. I like soupy fish porridge... plus lots of Chilli Padi. Ed: Well, we don't see a lot of them here in SG coz restaurants usually don't have big enough fish tanks to keep them. The restaurant probably bought the fish already frozen and cut up. Kell: Yeah.... chilli padi is a must!!! Btw, that reminds me of this joke. Q: Who is beehoon's biggest enemy? A: The Fish because 鱼骗米粉. Bellatrix: Aiyah. The joke also I read from somewhere one lah. So serious for what? Aloe: I don't really like the skin either coz many a times there are fishy smelly than tasty. Fortunately, this one was quite good and fresh. Speaking of fish, I don't eat fresh water fish coz they have this muddy taste. I supposed sea water fish taste better. Cleaner water? Aloe: You got me there for I have no answer to that. I am guessing it has a lot to do with the mud in fresh water? chocolategal: Then you might as well ask your mom to cook Bird's Eye Fish Fingers liao. That's cod (xue yu) for you.